Thyroid Diseases - Brief Understandable Introduction. Thyroid diseases are common nowadays. These are not rare diseases anymore. Thyroid is a gland situated bellow the Adam's apple. It releases hormones called T3 (tri-iodothyronine) and T4 (tetra-iodothyronine or thyroxine). T3 and T4 are metabolism enhancers, they increase the basal metabolism rate, heat production, heart rate, sweating and their normal levels are necessary to maintain a balance of catabolism (breakdown process in order to release energy) and anabolism (production of new molecules, proteins or other substances) of tissues. In normal persons the blood level of T3 and T4 is under the control of TSH ( thyroid stimulating hormone, released by brain pituitary). So if T3 or T4 concentration increases in blood TSH decreases and thyroid decreases their production. disease in the thyroid or disease in pituitary (brain origin) and these condition results in one of the two conditions. In Graves disease, there is an increase in Thyroid secretions i.e T3 and T4. This is an autoimmune disease. Autoimmune means that some antibodies that are produced by our own body start to stimulate the thyroid gland and thyroid gland starts producing more thyroxine. These antibodies bind to site where TSH normally binds to stimulate the thyroxine production. Symptoms Of Hyperthyroidism includes; increase sweating, progressive weight loss, blackening of skin color, increase in appetite, protruding of eye (exophathalmous), weakness, restlessness, increase in heart rate, tremors. Treatment: Treatment is either surgical or medical: Surgical treatment includes removal of a part of thyroid to decrease its secretions, and medical treatment includes administration of antithyroid drugs. My father also suffers hyperthyroidism and treated with antithyroid drugs and he is fine now. it is reverse of hyperthyroidism. In hypothyroidism the concentration of T3 and T4 decreases. symptoms: weight gain, thick skin, generalized non-pitting edema, dizziness, puffiness of the face, weakness, low metabolism, decrease appetite, lazy habits. Treatments: Exogenous Thyroxine is given in this condition.Thyroxine is available in tablet form. Treatment of cause is necessary if it lies outside thyroid e.g pituitary. How can we know either disease lies in Thyroid or Brain. By performing Thyroid function Test. by performing it we will have the concentrations of T3 T4 and TSH. 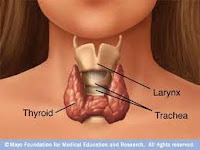 If T3 and T4 levels are decreased and TSH level is increased it means it is hypothyroidism and disease lies in Thyroid. If T3 and T4 levels are high and TSH level is low it means it is hyperthyroidism and disease lies in again in Thyroid.